The Subversive Archaeologist: The Beginning of the end for the Handaxe? The Amazin' Phrasin' of Michael Chazan and the Cold Steel of Occam's Razor Redux: [n]Ev[e]r[on] the Twain Shall Meet! The Beginning of the end for the Handaxe? The Amazin' Phrasin' of Michael Chazan and the Cold Steel of Occam's Razor Redux: [n]Ev[e]r[on] the Twain Shall Meet! This is the story of the Finished Artifact Fallacy (FAF). It's incessant mission: to infer strange new lithic technologies and new behavioural inferences: to boldly go where no palaeolithic archaeologist has gone before. 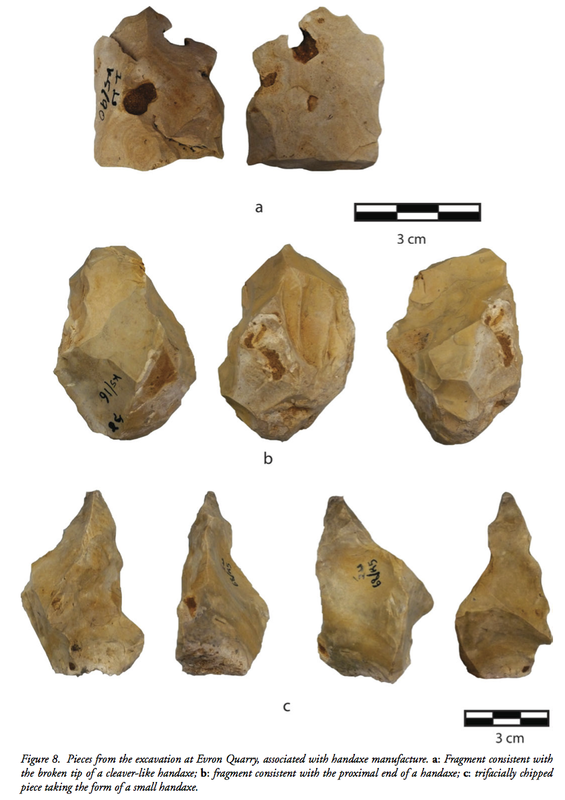 "Butchering with small tools: the implications of the Evron Quarry assemblage for the behaviour of Homo erectus," by Michael Chazan. Antiquity 87:350–367, 2013.
assemblage for the behaviour of Homo erectus,"
by Michael Chazan. Antiquity 87:350–367, 2013. Allright. I know. I'm a Star Trek fan. And it's probably very geeky to make an analogy between the FAF and the starship Enterprise's mission. Sometimes I just can't help myself! 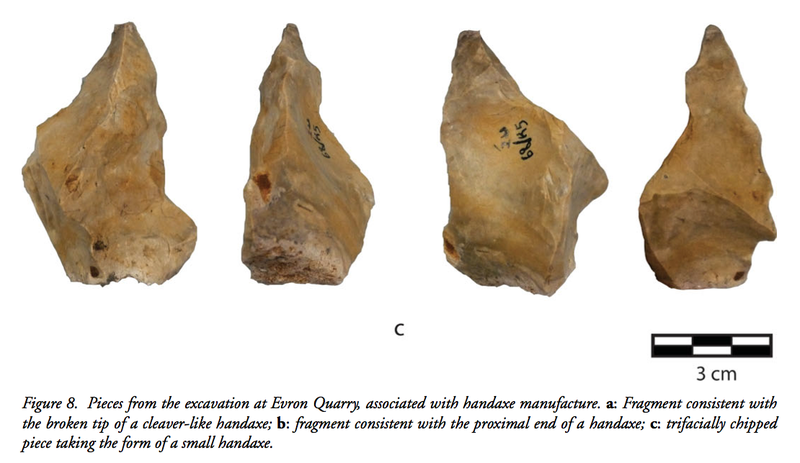 My paean to Star Trek was inspired by the just-published, peer-reviewed, "Butchering with small tools: the implications of the Evron Quarry assemblage for the behaviour of Homo erectus," by Michael Chazan. Antiquity 87:350–367, 2013. It may bear the Good Housekeeping Seal, but it is, fundamentally, flawed. The author, together with the Antiquity editors and referees ought to be charged with false and misleading advertising! The intellectual earthquake that this paper represents cannot be underestimated. 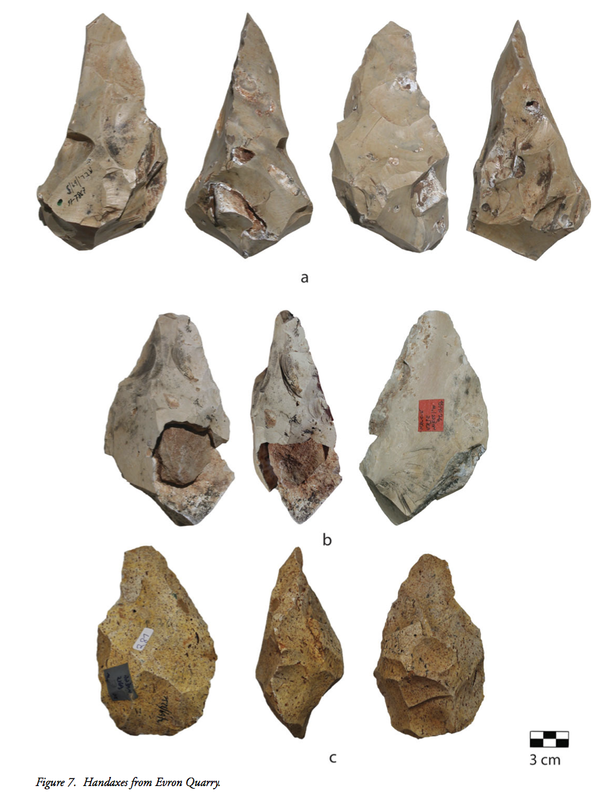 From it, we learn that "[s]mall tools are emerging as a common element of the Early Stone Age/Lower Palaeolithic toolkit ... . On Oldowan sites, including Omo 57, Omo 123, Wonderwerk Cave and Sterkfontein, flakes under 20mm in maximum dimension [averaging between 22.2 mm and 37.9 mm] are a major component of the assemblage and an intentional product of knapping ... " [emphasis added]. Remember that last phrase. It becomes important further down. What's wrong with me? I should be ecstatic that a palaeolithic archaeologist recognizes the central importance of flakes in the Oldowan and later technologies. But alas, my euphoria is still born. The author adheres to the old school of palaeolithic typology when he classifies some of the chipped stone pieces from Evron Quarry "choppers" and "polyhedrons." And, in a stunning bit of 'doublespeak' the author proceeds to re-re-reify the notion of the 'hand-axe.' According to Chazan, small flakes predominate at Evron Quarry as an "adaptation of local materials that make poor hand axes." Translation: Homo erectus was predisposed to make 'hand axes,' but couldn't. So they used flakes by themselves as a substitute for 'hand axes.' Those flakes, he argues, "reflect a level of conceptual thought [i.e. "an ingenious improvisation on the part of Homo erectus"] that allowed the occupants of Evron Quarry to solve the problem of how to butcher an elephant using only the material at hand." Almost takes your breath away. Don't it? Wait a sec. Isn't the material "at hand" always the only material 'at hand?' If those H. erecti were so clever, why didn't they walk a few kliks and find better material? After all, one of the site's early excavators declared the assemblage to be an artifactual accumulation of many temporally separate events. If that were true, surely during one of the times the H. erecti were elsewhere, they could have picked up some better material to take back to the quarry. [BTdub, that would be the Lower Palaeolithic equivalent of carrying coals to Newcastle!] Unless... No. Of course! I've got it! εὕρηκα! The explanation: at each of the times those bipedal apes left chipped rock on the ground at Evron Quarry, it was because they had just spotted [or caught a whiff of] the rotting carcass of an elephant. And, logically, fearful that the meat would be thoroughly spoiled if they spent time wandering around the countryside looking for the best raw material to make a 'hand axe' with which to butcher said carcass, they instead used whatever was 'at hand.' Nah. We should just take Michael Chazan's word for it. Or not. Do I really think Chazan is asking us to accept such a monumental shortcoming on the part of H. erectus? Evidently. But I'm not sure the author even realizes how badly this looks for an "ingenious" species like H. erectus. Even if that were its only shortcoming this paper would be an "archaeological howler." But, buried in the data presentation there's an even more fundamental error in thinking. As if the author's effusive praise for the quick-thinking H. erecti wasn't comic enough when viewed in terms of my [half] facetious scenario, we learn that indeed there are 'hand axes' in the Evron assemblage. But these "are all very thick," and "[u]nfortunately no complete handaxes were found in the excavation" [emphasis mine, SA]. Hmmm. In a minit I'll be showing you the 'hand axes' from the quarry site. There were apparently quite a few, only no "complete" ones came from the three test pits that Chazan used as his sample, which he refers to as "the excavation." It's like this. Were he to entertain the notion that the 'choppers,' 'polyhedrons' and 'hand axes' were among the 'cores' that gave birth to the abundant small flakes, he would also have to consider the possibility that all the other 'hand axes' in all the sites, in all the world, are, after all, just cores. And that would naturally lead to the realization---the reality that dare not speak its name---might well be just a fantasy that exists only in the mind of [admittedly a great many] archaeologists. A reified category. In plain English, the 'hand axe'---the 'mental template' supposedly in the mind of its maker, the 'desired' end product, the 'finished' artifact---is fallacious! Shiver my timbers! The FAF would be nothing to worry about, were it not that, where the Lower and Middle Palaeolithic are concerned, its perpetuation is a pernicious and persistent obstacle to a better understanding of our origins. [IMHO, of course.] Now, let's take a closer look at Michael Chazan's argument. 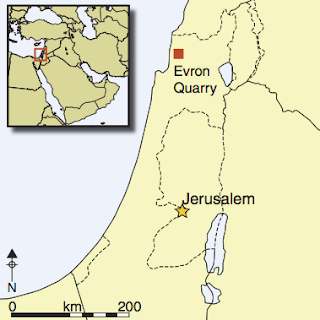 First, though, let's look at the Evron Quarry 'hand axes' that didn't appear in the author's "excavation." Check out the image below. The author calls these "pieces [of rock] ... [bits that are] associated with handaxe manufacture" [emphasis added]. Isn't it odd that, instead of calling them something like 'hand axe fragments"he chooses to call them [things] "associated with handaxe manufacture?" Why can't he just call a spade a spade? Why can't he see that these, too, are cores, not quasi 'hand axes' bits? He has told us that the numerous flakes themselves were " ... an intentional product of knapping ... ." Where does that leave the 'hand axes?' The author's answer is that they simply weren't there in the numbers that should be expected in a Lower Palaeolithic elephant butchering theatre. So, now, on the one hand we have the 'hand axes,' which are the desired end product of the H. erectus brain, and on the other hand we have the small, useful flakes. Here's where it gets really tricky, philosophically speaking. Are the flakes really debitage? Or are the 'hand axes,' 'choppers,' and 'polyhedrons' just cores? I'm not singling Michael Chazan out for punishment. He's not alone in trying to ascertain how many bipedal apes can dance on the distal extremity of a 'hand axe.' Inevitably, by cleaving to the FAF, they'll buy themselves "a ticket to obscurity" [excerpted from Famous Last Words of the Subversive Archaeologist, Vanity Press International, 2013]. I have to ask, "Has every archaeologist on the planet drunk the Bordesian typological Kool-Aid?" Source: Comme on dit en France, "Divine." And speaking of drinking. When I started to write this blurt it was last Friday afternoon. I took a moment to plug a very decent $5 sparkling wine that Trader Joe's carries, and which I was, at the time, drinking. 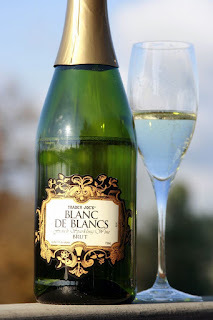 It's officially called Trader Joe's Blanc de Blancs Brut, and it's very colourful on the tongue. It's imported from France [so it must be good], and this grassy, pale beauty is every bit the peer of Freixenet, which at one time you could buy for $5, but which has suffered the fate of popularity, and had the price elevated due the disparity between supply and demand. [You know? I've always mistrusted the notion of supply and demand as the being the natural force determining value. It's too easy, don't you think, to consciously reduce output so as to encourage higher prices. The oil companies do it by limiting the number of refineries. OPEC does it by turning the well spigot a quarter turn to the right. Is it too far-fetched to think that wineries might do the same, even in the absence of demand in excess of production? On the other hand, maybe drinking too much can engender conspiracy theories. I look forward to seeing you next time. Thanks for visiting! AND REMEMBER, ANY TIME IS A GOOD TIME TO GET GOOD STUFF AT THE SUBVERSIVE ARCHAEOLOGIST'S OWN, EXCLUSIVE "A DRINK IS LIKE A HUG" ONLINE BOUTIQUE! It's Time For The Terrible Twos! You Say Panina, and I Say Panidae.